California is a beautiful state with a breathtaking diversity of natural communities. From the granite spires of Yosemite, to the wildflowers of Anza Borrego desert, from the rolling oak woodlands of the inland valleys to the tide pools of the Pacific Coast, California is a naturalist’s paradise. There are many ways to explore and discover all that our state has to offer. The California Naturalist Program seeks to guide discovery both by experiencing the natural world as John Muir and other Naturalist might have, and to research and monitor particular aspects as scientist do. Discovery can be as focused as a water quality study in the creek that runs through your neighborhood, or as broad as learning about how the snow in the Sierra affects the crops in the central valley. Are you a person who enjoys taking measurements and collecting data or do you prefer planting trees and talking with native elders? The beauty of the Naturalist is that they do both. Naturalists are both scientists studying the details and observers of the whole. You will discover that all the parts of a natural system, the water, plants and animals, are connected and dependent to varying extents on all the other parts. Discovery is a life long process. 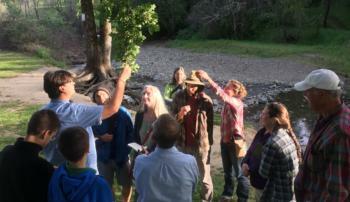 Continue to learn and share your knowledge with others in the California Naturalist Program.